looks wonderful! I may just have to go out tonight and buy a watermelon! Oh man, that looks delish! It will definitely be in my “must try” list for next year when I am definitely doing a veggie garden. Too busy this year to have one but I’m already making plans for next summer! I can’t wait to make this. I HAVE to have watermelon everyday. It is a must! Hope you are feeling ok! I am having sciatic nerve issues too. Fun times:) Only a few months left! Oh, that looks great! 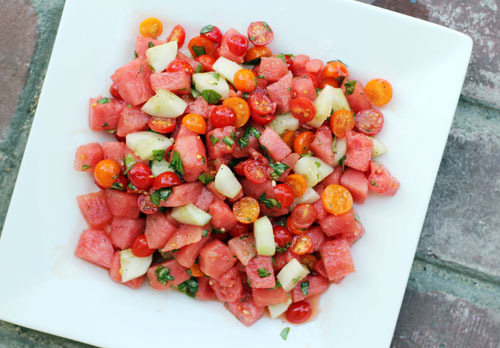 I haven’t made a watermelon salad yet this year, thanks for the inspiration! I am so hot right now! I wish you were here to serve me that salad. Looks just perfect. Will be trying it this weekend. Jane – that looks amazing!! The fiance doesn’t like tomatoes (I know, I don’t get it, either), but he may just have to “suffer” through this salad for me! Nowadays, series of children experience heat stroke… I believe taking too much liquid could prevent that from happening. Why not making this kind of delicious dish.. 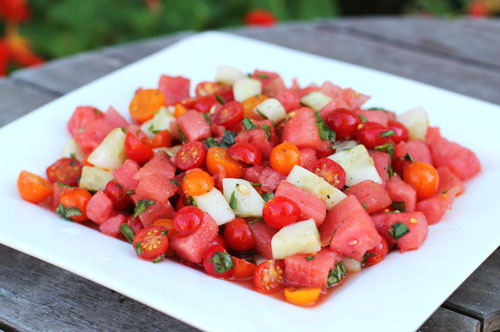 I know watermelon is a lycopene-rich fruit, so it will be a big help. Thank you very much for sharing this delish-blog. I make a version of this with reduced balsamic vinegar (equal amounts balsamic and brown sugar reduced until syrupy) and mozzarella that is one of my favorite summer dishes. I just had this salad for lunch and it was great! Added some feta chees, and mint, which I loved. This was excellent!! I have made this twice for BBQs and it was a hit both times!! Thanks!! This was super delish and easy!!! I made this one night very quickly after a long day at work. It was light but perfectly filling for a summer’s night meal. Thanks for the modifications from the original recipe. I also used Ricotta Salata instead of Goat Cheese. Oh… I forgot to add that my husband and 21-month old son cleaned their plates and had seconds with this salad. It’s a new family fav! so glad you love the recipe – and I LOVE the ricotta salata substitution, I’m doing that next time!!! thank you!